Pro Mujer announces the retirement of its Co-Founder and Director Emerita Lynne Patterson, whose vision of a world where all women thrive gave birth to one of Latin America's leading women's development organizations. Pro Mujer announced today the retirement of its Co-Founder and Director Emerita Lynne Patterson, whose vision of a world where all women thrive gave birth to Pro Mujer 26 years ago. 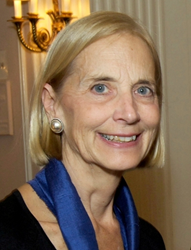 Since Patterson and Co-Founder Carmen Velasco joined forces in El Alto, Bolivia in 1990, the organization has grown to serve more than 250,000 women and their family members annually across five countries in Latin America, and has positioned itself as a thought leader on women’s empowerment and financial inclusion in the region. After a highly successful, fulfilling career, Lynne Patterson retires knowing that Maria Cavalcanti's extraordinary vision for the next 25 years will position Pro Mujer as an innovative platform, offering women in Latin America access to a wide range of transformative services. By leveraging strategic alliances and partnerships, Pro Mujer will reach millions of women throughout Latin America. Pro Mujer is headquartered in New York City to support operations in Argentina, Bolivia, Mexico, Nicaragua, and Peru. For more information, please visit promujer.org or join the conversation on Twitter, LinkedIn, and Facebook.